Up on the slopes of Mount Parnassus, in the time before Time, the young god Apollo slew the monster Python and founded a shrine commemorating the event. It was the omphalos, the navel or center of the world, and Pegasus swooped in and stamped his hoof and cracked the ground from which came forth the Castalian Spring, pluming underground waters bearing a sweet perfume. (Of the last, so said Plutarch.) Down in an enclosed subterranean chamber, the Pythian Sibyl sat on a three-legged stool, breathed in the vapors surrounding her, swooned into a trance, and uttered delirious visions that would be translated, by the Pythian Priestesses, into prophesies that would command the fortunes of the kings of the world. The Sibyl was a huffer. In 2001, geologists discovered that two geologic faults intersected directly beneath the ruins of the Delphic Shrine. About every hundred years, earthquakes rattle the faults, heating the adjacent rocks and vaporizing the hydrocarbon deposits stored in them. The result: ethylene vapors, which, inhaled in concentration, produce a sense of disembodied euphoria. It is no longer a myth or a tall tale: that’s how the Pythian Sibyl received her visions from Apollo. Read more about the Delphic Oracle’s drug use here and here. 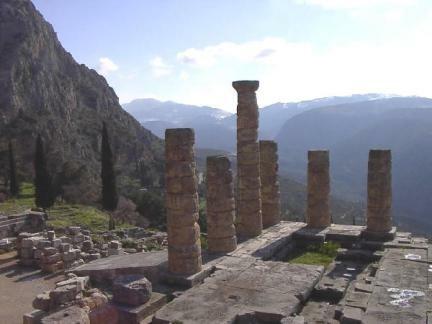 See Delphi and get a whiff of myth on Travel Dynamics International’s Landmark Sites of the Mediterranean: Greece, Sicily, North Africa, and Spain from November 9-28, 2008.